Remove tops, seed pod and thick white membrane of the green peppers. Steam the peppers until soft, about 10-12 minutes. 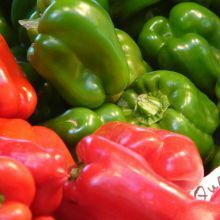 While steaming peppers saute the onion and garlic in a large fry pan, with a small amount of olive oil until the onion is soft but not browned. possible from the bread. Saute this mixture for about 3-4 minutes or until well mixed. Remove the mixture to a small bowl, reserve. Place the ground beef into the fry pan and brown just until all redness is gone, constantly breaking up any large clumps of beef. Add the onion, caper, anchovy mixture to the pan and continue to saute for a few minutes. Add a few tablespoons of tomato sauce, breadcrumbs and parmesan cheese. Remove from the heat and stir to make sure all ingredients are well incorporated. Taste for seasoning. Allow to cool slightly. Stuff each pepper with the mixture, being careful not to over pack the ground beef mixture. When all are stuffed, place them in a baking pan, on a rack, with about a ½ inch of water in the bottom of the pan. Top each stuffed pepper with a drizzle of olive oil and about a tablespoon of tomato sauce. Bake at 350°F for about 30 minutes. Serve with additional tomato sauce and parmesan cheese. “Maria Carmella”. See the dedication. She fooled us all . . . and is enjoying the laugh!